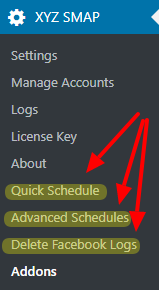 In the plugin settings page we can setup the advanced scheduling. 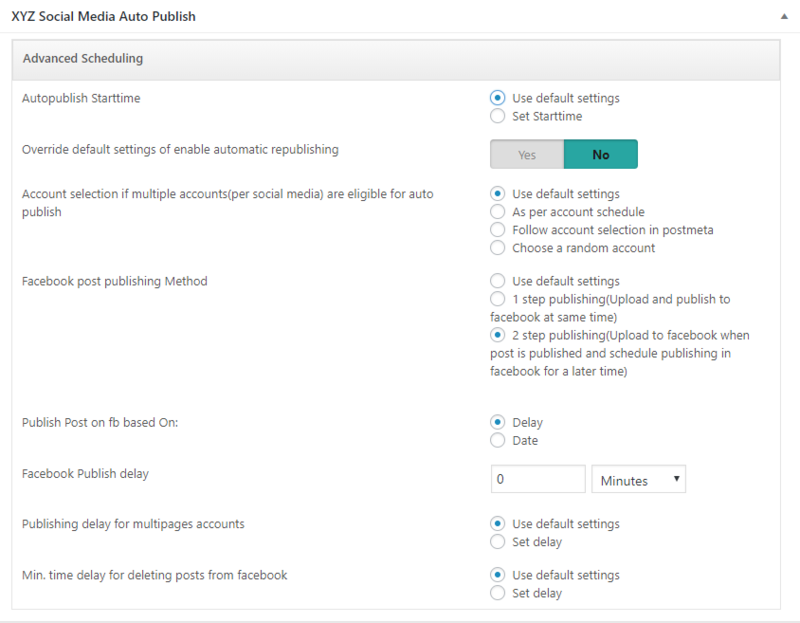 Account selection if multiple accounts(per social media) are eligible for auto publish – If there are many social media accounts we can select the advanced scheduling option. There are 3 options available. We can use accounts as per the account schedule, Choose all eligible accounts or choose a random account for advanced scheduling. Publishing delay for multipage accounts – This is the delay set after publishing the post to ‘x’ pages. Publishing delay between 2 consecutive posts to a social media – This is the delay between 2 consecutive posts to a social media account. Facebook post publishing Method – We have 1 step and 2 step publishing. In one step we can upload the post to facebook and publish it in facebook at the same time. In the 2 step publishing we can upload the post to facebook and set a delay before publishing in facebook. Facebook Publish delay – This is the Facebook Publish delay for the 2 step publishing. Use wordpress post publish time while publishing to facebook pages – Here we can show the post original publishing date in facebook instead of the facebook publishing time. Delete posts from facebook after an interval – We can delete the posts published to facebook using the plugin after a delay. This is the interval to delete the posts from Facebook. Min. time delay for deleting posts from facebook – This is the minimum time delay for deleting the posts from facebook. Facebook Post delete Cron command – This is the facebook post delete cron command. Using this we can delete the posts from Facebook which are published through the SMAP plugin and also the facebook delete logs. Cron interval for clearing facebook delete logs – This is the interval for removing the ‘facebook delete logs’ from the system. Max. no. of facebook post delete tasks to be processed per cron – This is the maximum number of posts deleted from facebook in a single cron execution. Republish interval – This is the interval of republishing the post. Stop republishing based on – We can stop the republishing based on the date or republish count. Stop Time – This is the stop time of the republishing. Republish Count – This is the republish count to stop republishing. Quick schedule will work only if the ‘scheduling of the automatic publishing’ is enabled. 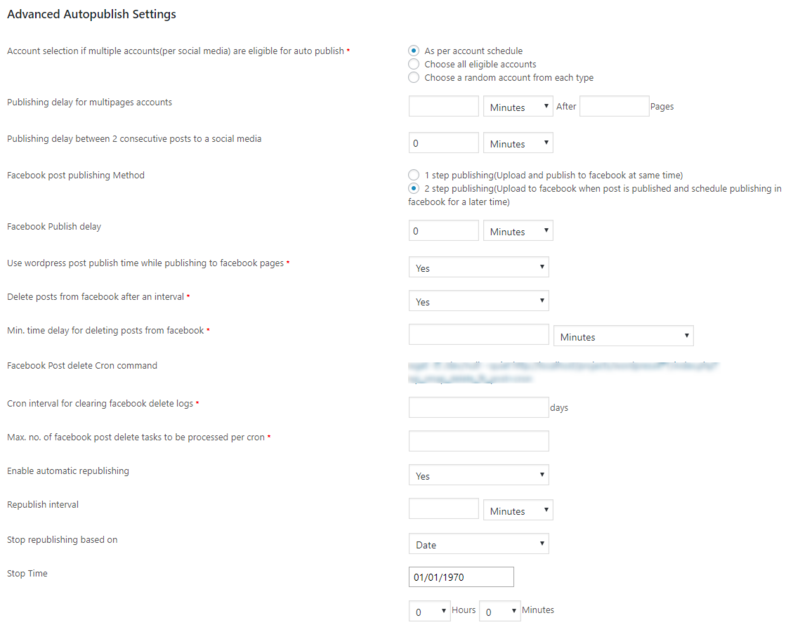 Post – If you want to publish old posts(quick schedule) to social media, please select the post option. Now we can select the post in “All categories or Specific categories”. Custom Post Types – We can select it if we want to quick schedule custom post type. Pages – Select this option if you want to quick schedule the pages to social media. Start Date (Publish time>=) and End Date (Publish time<=) – This is the time range of the old posts for quick scheduling. Sort By – We can sort the posts based on the publish date or update date ascending order or descending order. Post ids to be excluded from publishing(Comma separated values) – We have the option of not publishing some posts by entering the post id. The excluded posts won’t publish through the quick scheduling. You can add multiple post ids, separated by comma. Select account for publish – We can select the accounts for quick scheduling here and the post will publish to these selected accounts. Min. time delay for publishing posts – This is the minimum time delay of publishing the posts after scheduling. Publishing delay for multiple posts – This is the delay after publishing some posts. If the value is 10 minutes after 5 posts, there will be a delay of 10 minutes after publishing 5 posts. Enable automatic republishing – We can automatically republish the quick scheduled posts here. Republish interval – This is the interval for republishing the same post. If it is 24 hours, the same post will republish after 24 hours. Stop republishing based on – Here we can stop the republishing based on date or publish count. If we set a date, the republishing will stop on the date. If the republishing stop is based on the publishing count, it will stop republish after the publish count. Enable random posting – If we enable this option, the system will select a random post and publish it to social media. When we submit the quick schedule, it will schedule all the selected posts/post types in the date period to selected social media. Using the quick schedule option we can publish the old posts to social media without editing each posts. When creating a new post/page/custom post type, we can enable the advanced scheduling. This option is available as a metabox in the bottom of each post. Override default settings of enable automatic republishing – We can either use the default settings or override the automatic republishing option. If we are overriding the republishing we can enable/disable the republishing and set the republishing interval and stop republishing based on count or date. 2. As per each account schedule – Here we are following the schedule of each account selected. 3. 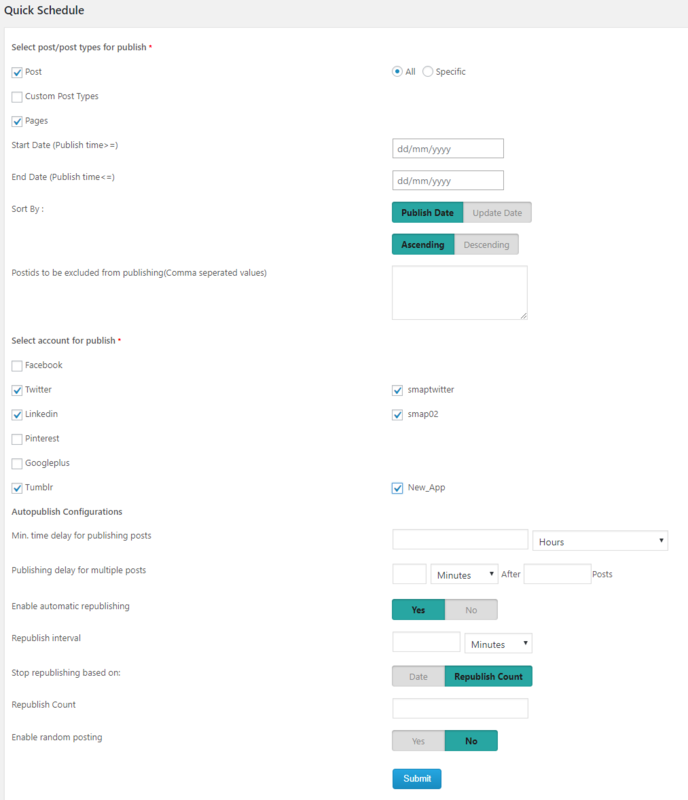 Follow account selection in postmeta – If we use this option we can select the social media account in the post meta section. 4. Choose a random account – If we use this option the system will select a random account and publish to this account. Facebook post publishing Method – There are 2 options for facebook publishing, 1step publishing and 2 step publishing. In the 1 step publishing we are uploading and publishing to facebook at same time and in the 2 step publishing we are uploading to facebook when post is published and schedule publishing in facebook for a later time. In the 2 step publishing, we can publish based on delay or in a particular date with time. Publishing delay for multipages accounts – We can either use the default settings or set a delay after “x” number of posts. Min. time delay for deleting posts from facebook – This is the delay for deleting the posts from facebook and we can use the default settings or set a delay here. We can see all the advanced scheduled posts in the “Advanced Schedules” section. Here we can see the start time, repeat status, repeat interval, FB posting method, Fb posting interval, Time. To edit the advanced scheduling, click the “Edit” button and to delete the scheduling ,click the “Delete” button. In this section we can see all the facebook entries and can delete it.